Francis Marion Stafford and Marietta Hager Lavender, abt 1885. Front row (kids,L-R):Ethel, Edna, May, Carrie, Dora. 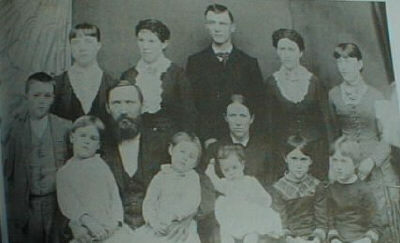 Second row: (L-R): Tom, Francis Marion, Marietta Third row: (L-R): Arminta or "Mintie" , Hattie, William T., Calista, Ella This information was provided by Walt Stafford after meeting with Martha Mary Smith, grand-daughter of Frances Marion Stafford and niece of DeWitt Stafford, while on vacation recently in Paintsville, KY. She is currently living next door the F.M. Stafford house.